Two hours gives you plenty of time to cruise Eastbourne's bays and cafes, ride the seaside Eastbourne Heritage Trail, or make a quick trip out to the Pencarrow lighthouses and lakes and back. Easy riding, suitable for beginners. Four hours gives you enough time to really explore the Eastern Bays and everything they have to offer, along with heading out to Pencarrow to check out the lighthouses and lakes. Pack a picnic for a perfect Days Bay day! A full day gives you enough time to do all of the above, as well as heading further afield to Orongorongo Valley and Turakirae Head, home of one of Wellington's largest seal colonies. 40km plus, decent fitness levels required! Grab a comfort mountainbike and go exploring! A full day gives enough time to get to Pencarrow with its lighthouses and lakes, Baring Head with WW2 bunkers and amazing views, and the seal colony at Turakirae Head. Good fitness levels req'd! 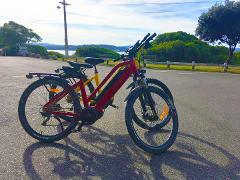 Grab an electric bike and go exploring! A full day gives enough time (and battery power) to get to Pencarrow Head with its lighthouses and lakes, Baring Head with WW2 bunkers and amazing views, and the seal colony at Turakirae Head.